WINCHESTER, Va., Nov. 1, 2010 – Trex Company is expanding its high-performance Trex Transcend® decking collection to include a full range of aesthetic options with the introduction of two new tropical styles. Inspired by the beauty of streaked hardwoods, the new offerings feature the superior durability, low-maintenance and eco-friendly qualities of the innovative Transcend collection. The new Trex Transcend colors both feature subtle shading and natural shade variations – creating distinctive hardwood-like streaking and intense, tropical hues that will retain their lush looks for decades. Spiced Rum is a warm, earthy umber, while Lava Rock features rich reddish-black hardwood streaking. These strong new color options will join the collection’s four current colors inspired by the great outdoors – Tree House (light brown), Vintage Lantern (deep-burnished bronze), Fire Pit (spicy red) and Gravel Path (pristine grey). Although the new Transcend styles boast the beauty of tropical wood, there are no environmental stresses associated with importing endangered hardwoods. Like all Trex wood-alternative products, Transcend decking contains 95 percent recycled content – contributing to the LEED points of any residential or commercial structure – and is certified by the Verification of Attributes Report (VAR-1011) from the International Code Council Evaluation Service® (ICC-ES). As a company built on green principles and values, Trex saves approximately 600 million pounds of plastic and wood scraps from landfills each year and recycles approximately 1.5 billion plastic grocery bags – or seven out of every 10 in the United States. The revolutionary Trex Transcend collection first debuted in spring 2010 and is designed to outperform wood, composite and PVC for decades. Each deck board features a proprietary nine-element surface formulation that produces a natural, wood-like grain pattern with a lustrous satin finish that feels comfortable underfoot. Engineered with an exclusive low-sheen, high-traffic formulation, Trex Transcend decking resists fading, staining, scratching and mold – and will not rot, warp, crack or splinter. Upkeep is hassle-free and requires no sanding, staining or painting. In fact, spills wash off easily with just soap and water. Each Transcend deck board is available in two profile options – square and grooved. The grooved boards accommodate the Trex Hideaway® Hidden Fastening System, which allows for a smooth, unfettered finish, free of nails and other visible fasteners. The system’s clips create a seamless look with no screws or screw holes to interrupt the smooth texture and comfortable feel of the decking. The new Transcend exotic looks coordinate seamlessly with the existing Transcend railing options in six colors. With modular construction that provides superior design flexibility, contractors and consumers may mix and match balusters, posts, top rails and spindles to create a completely customized outdoor living space. Transcend Railing features a strong, sturdy look and feel coupled with quick and easy assembly. The entire Transcend decking collection is backed by a 25-year Limited Fade and Stain Warranty that is unprecedented in the industry. The new Trex Transcend boards also meet the ASTIM E84 Class B fire-resistance rating, as required by the California State Fire Marshall. For more information about Trex products – or to experiment with the online color visualizer or 3-D deck design tool – visit trex.com. Trex Company is the nation’s largest manufacturer of wood-alternative decking and railing with nearly 20 years of product experience. Built on “green” principles and values, Trex® outdoor living products offer significant design flexibility with fewer ongoing maintenance requirements than wood, as well as a truly environmentally responsible choice. The cornerstone of the Trex product portfolio is the new Trex Transcend® high-performance decking and railing system, which combines superior durability and aesthetics. In addition, Trex distributes ultra-low maintenance PVC decking under the trademark Trex Escapes® and PVC trim under the trademark TrexTrim™. For more information, visit the company’s website trex.com. 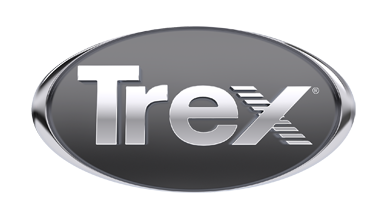 Trex®, Trex Transcend®, Trex Escapes®, TrexTrim™ and Trex Hideaway® are trademarks of Trex Company, Inc., Winchester, Va.